Polymer Matrix Composites (PMC) are one kind of the earliest developed, most widely studied and used composite materials nowadays. PMC are usually classified by two ways. One is divided into thermosetting resin matrix composites and thermoplastic resin matrix composites according to the characteristic of matrix. The other is classified based on the type of reinforcement and the distribution in composites. According to the type of reinforcement, it can be divided into fiber-reinforced polymer matrix composites, whisker-reinforced polymer matrix composites, and particle-reinforced polymer matrix composites. Fiber-reinforced polymer matrix composites can be divided into continuous and discontinuous fiber-reinforced polymer matrix composites. According to the type of fiber, it can be divided into glass fiber, carbon fiber, and aramid fiber-reinforced polymer matrix composites. 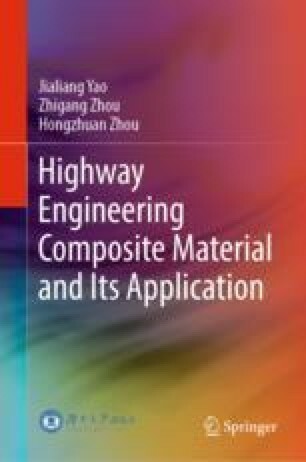 The polymer matrix, polymer concrete, and other applications of polymers in concrete are introduced in this chapter.